Hydrometallurgy of Rare Earths: Extraction and Separation provides the basic knowledge for rare earth extraction and separation, including flow sheet selection criteria and related technology. The book includes the latest research findings on all rare earth separation processes, methods of controlling operation costs, and strategies that help lower wastewater and waste solid discharge. 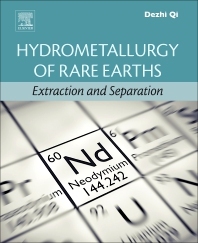 It discusses many real process parameters and actual situations in rare earth separation plants, also examining the basic principles, technologies, process parameters and advances and achievements in the area of rare earth extraction and separation. In addition, the book covers extraction separation theory as developed by Professor Guanxian Xu and Professor Chunhua Yan and the creative use of a computational simulation program to replace the bench scale and pilot plant tests and directly design rare earth extraction separation processes. Dr. Dezhi Qi earned his bachelor’s degree in hydrometallurgy of rare metals with an emphasis on rare earth metallurgy, and his master’s degree in Chemistry. He has worked in a rare earth separation plant for one year, focusing on theory and technology. For three years, he worked as a process engineer for Avalon Rare Metals. He has developed one dynamic and one static simulation program to simulate and design the processes of rare earth separation. The simulation program is the first of its kind outside of China.